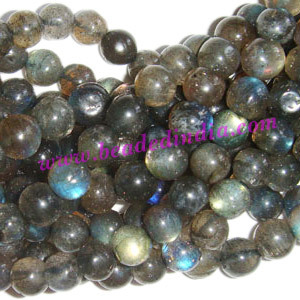 Labradorite 8mm round 108 semi precious beads mala, also called gemstone rosary mala, prayer mala, japa mala for chanting mantra. Number of beads, size and stringing order can be customized. Gold Plated Metal Chain, size: 1x4mm, approx 45.5 meters in a Kg. Silver Plated Headpin size: 0.5 inch (12.5 mm), head size : 10mm, weight: 0.38 grams. Leather Cords 2.0mm flat, metallic color - mint green. Sterling Silver .925 Fancy Beads, size: 21x19x10mm, weight: 2.83 grams. Leather Cords 1.5mm (one and half mm) round, regular color - walnut.